AUSTIN, TX - It's the President's favorite place to play. And he hasn't even had time to get acquainted with the new Fazio Canyons Course, named No. 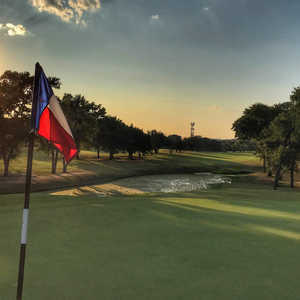 1 resort course in Texas by TravelGolf.com. No. 2 on that list is Barton Creek's Fazio Foothills. Shortly after his inauguration, President George W. Bush, traded the Governor's Mansion in Austin for 1600 Pennsylvania Avenue in Washington, D.C. But Texas is always on his mind. And when he has the time, his favorite place to play golf is Barton Creek Resort and Country Club. "President Bush has been a longtime friend of Barton Creek and we greatly look forward to welcoming him back here as our nation's 43rd President," said Gregg Pate, Barton Creek President and Chief Operating Officer. "Like President Bush, we take great pride in our Texas roots and are delighted to take this opportunity to showcase the very best our state has to offer to travelers everywhere." Barton Creek, a Pinehurst Company Resort, is Presidential. Aside from the award-winning Fazio Canyons and Fazio Foothills gems, one can't go wrong with the Crenshaw Cliffside layout, designed by Austin native and PGA great Ben Crenshaw and Bill Coore. And 25 miles away on the shores of Lake Travis is Barton Creek's Palmer Lakeside course. Like thousands of golfers before him, President Bush said his favorite hole at Barton Creek is the par-3 No. 9 on the Fazio Foothills layout. The 175-yarder features a waterfall than runs into a ravine and grotto to the left of the green and in front of the hole. And just in case one gets too cocky, the renowned designer Tom Fazio added treacherous bunkers to the right and back of the green. The President might just like Fazio Canyons even better. Fazio, who designed Foothills in 1986, proved he's getting better when the Canyons' 7,161-yard, par-72 belle opened in 2000. Ask any golfer who has played both layouts today and he will tell you picking a favorite is like choosing between Pebble Beach or Cypress Point -- you don't want to miss either one. "If you study the two courses, Foothills and Canyons, the No. 1 thing is you can see the differences of the design qualities," said Chip Gist, Barton Creek's Director of Golf. "There is a difference of 15 years in which Fazio polished his style. Foothills has smaller landing areas and smaller greens. And Canyons, built on twice the acreage, has larger targets and larger greens. I'm still trying to figure out the subtle putts on Canyons' greens. "The terrain at Foothills is a little more severe while Canyons is more rolling, but still has some high tee-box vistas with downhill drives. If you turn around on the 15th tee you can see the state capitol building 15 miles away," he said. What you really will like about Canyons, however, is the feeling of playing a round all by your lonesome. There are no houses at this time and no parallel fairways right there in your vision. Nowhere on the Canyons layout do you feel more secluded than on the par-3 No. 3, a 173-yard shot into a box canyon with Short Springs Branch Creek trickling down the right border. The Champions Bermuda green is quick and tricky and the flinty hillside surrounds you creating echoes in the silence. The par-4 No. 9 features an unsettling tee shot and plays uphill 457 yards to earn the No. 1 handicap rating. If the length isn't enough challenge for you, anything hit right will find water, which is clearly in view from the tee, cascading down and glimmering in the sunlight, the entire distance of the hole. No. 10 is just as beautiful, but a more manageable 450 yards downhill. Hit your tee shot right of the huge bunker, which guards the left at the bend of the dogleg. Then the approach must clear the creek right in front of the putting surface and includes limestone stepping stones from the fairway to the green. The scenic par-3 11th is next at 192 yards from the back and is encircled on all sides by trouble -- rocky hillsides frame the hole and the creek sprints down the left. Canyons is a Hill Country escape. The limestone-rock hillsides feature prickly-pear cacti, aged, pink-skinned, Madrone trees, Spanish oaks, red oaks, junipers and sycamore trees on the 210 acres. It also comes with the signature designation of a Certified Audubon Sanctuary haven. The environment is protected here. Barton Creek Resort hasn't rested on its awards either. A $50-million expansion and renovation project was completed in the summer of 2000, which includes 158 new guest rooms, a new tennis complex, expanded meeting space and restaurant capacity, as well as the addition of a $1.2 million resort swimming pool. 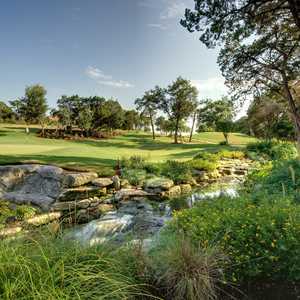 "Designing our second course at Barton Creek was both an exciting opportunity and a unique challenge," Fazio said. "Returning to Austin brought back many fond memories, but since Fazio Foothills was highly ranked in Texas and the nation, we had high expectations to meet and surpass it. 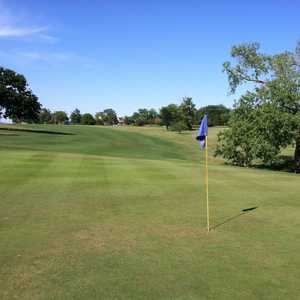 Fortunately for us, ClubCorp Resorts had a magnificent piece of Texas Hill Country and was totally committed to creating a golf experience of uncompromising quality. It is pure excitement and a great conclusion to a golf course that we believe exceeds all the expectations that anyone could possibly have." Historically, the Fazio Foothills course was available to resort guests only two days of the week. With the opening of the Fazio Canyons course, one of the two Fazio designs will be available to both resort guests and members every day of the week. In August 1989, the Liberty Mutual Insurance Company announced Barton Creek as the new site for the Legends of Golf senior pro tournament. The Legends tournament was held at the resort each spring from April 1990 to May 1994, bringing extensive, well-deserved national exposure to Barton Creek. It was the second location (Onion Creek in Austin was the first) of the tournament, which became the birth of the Senior PGA Tour. Directions: From Austin's Bergstrom International Airport: As you exit the airport on Presidential Blvd., make a left on Highway 71 heading west. Drive 5.5 miles on Highway 71 west, passing Interstate 35, to the exit for Loop 360. Take Loop 360 north 7.7 miles to the exit for Bee Cave Road (R.M. 2244). Make a left on Bee Caves Road and go 1 mile to the stop light for Barton Creek Boulevard. Make a left on Barton Creek Boulevard and go 1.8 miles to Barton Club Drive and turn left into the resort complex. Proceed to the Executive Conference Center (third entrance on the left) for guest check-in. Things to do in Austin: No trip to Austin would be complete without a visit to the Texas Capitol, the nation's largest state capitol. A guided tour takes you through this more than 100-year-old pink granite building. View the grand rotunda, the House and Senate chambers and galleries, life-size statues of Stephen F. Austin and Sam Houston, and numerous historical paintings. Tours every 15 minutes: Monday-Friday, 8:30 a.m.-4:15 p.m.; Saturday-Sunday, 9:30 a.m.-4:15 p.m. Open Monday-Friday, 7 a.m.-10 p.m.; Saturday-Sunday, 9 a.m.-5 p.m. Closed major holidays.